Smart is a term that has come to describe everything from health and banking to entire cities. It takes an asset, infrastructure, or even transaction, ensures it is connected, analyzes its data and makes it more autonomous and effective. Smart is the layer of insight and decision-making above the interactions between connected things. We are on the cusp of a smart revolution that could fundamentally change the way the world works. AI is integral to smart because it can autonomously assimilate inputs, perceive and understand a need and deliver the best possible decision. The next step is the combination of AI’s autonomous reasoning with “deep learning.” By learning from every new input and experience, AI adds to the efficacy of subsequent actions. AI’s deep learning and robotic automation also bring closer the possibility of “singularity”: the point at which machine thought supersedes human capability. It sounds like science fiction, but consensus suggests that, within a decade, smart might solve problems that humans struggle to conceptualize. The ability to assimilate, analyze and make decisions in more complex and scalable ways than ever before enhances effectiveness – enabling the optimal use of power grids, transportation networks, production lines, health services, supply chains and health data. Smart is also empowering customers with more information and greater insight than ever before. The empowered customer can use those insights to take action, adapt their energy usage, change their travel habits or manage their health proactively. The greatest challenge in smart is execution. Smart requires holistic change encompassing three core elements. Setting the change agenda: In many aspects, the business case for smart still needs to be clarified and repeatedly tested. 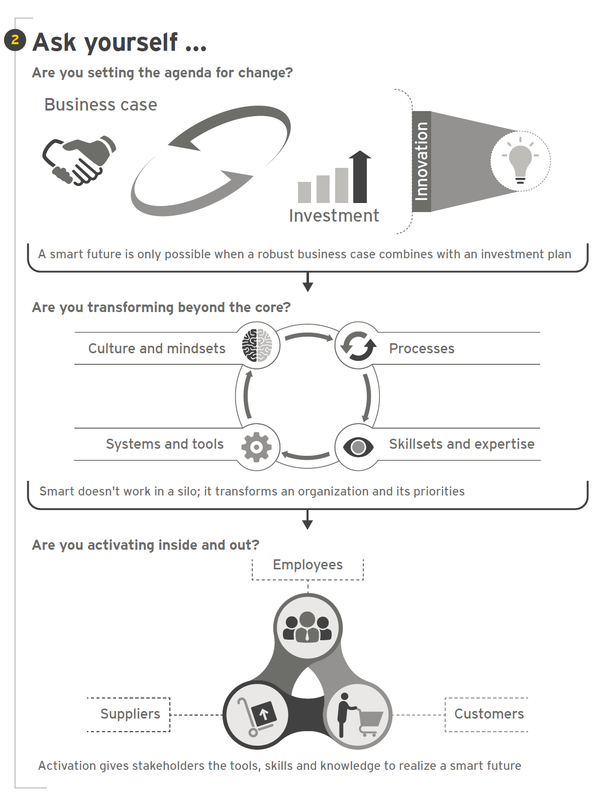 Transforming beyond the core: If smart is to be effective, it requires an end-to-end redesign of organizational models. This will create new roles and increase the importance of others, such as the chief data officer. Activating inside and out: Smart goes far beyond technological implementation and organizational change. A smart strategy requires activation through educating customers about what to do with the data and what actions to take. “Gartner Symposium/ITxpo 2015,” Gartner, November 2015. “Deep Interest In AI: New High In Deals To Artificial Intelligence Startups In Q4’15,” CB Insights, February 2016.
International Federation of Robotics, Japan Robot Association; Japan Ministry of Economy, Trade & Industry; euRobotics; company filings; BCG, EY Analysis. “Cisco VNI Global IP Traffic Forecast, 2014–2019,” Cisco, 2015. “Artificial Intelligence Framework for Simulating Clinical Decision-Making” Artificial Intelligence in Medicine, 2014. “Global Tablet Forecast 2015 To 2018,” Forrester, Sept 2015. “Why self-driving trucks will help solve urban traffic problems,” Smart Cities Council, March 2016. “Smart Grid Technologies,” Navigant Research, 2014. “2015 Roundup of 3D Printing Market Forecasts and Estimates,” Forbes.com, March 2015. “Big Data Could Help Some of the 200,000 NYC Households That Get Eviction Notices This Year,” Next City, 2015. “Smart Plug In: EY’s Latest Insights for Power & Utilities,” EY, November 2014.